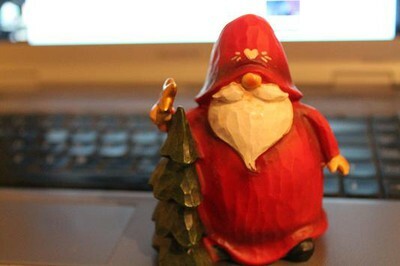 Your eyes do not decieve you, that is santa... well, no, it's not santa, it's a tomte, which are much cuter than santas. We had christmas a month early in our house. In part because some members were going to be out of the country, and also in part because we're mostly impatient youth that get all itchy to open presents. And open presents we did! My darling love gave me a swanky camera and knew me well enough to include the memory card, the protective over lens thing, and the storage bag. It's a beautiful canon EOS 1100D which will from this point on be fondly referred to as Betsy. I was also gifted a box of books. Yes, that's what you read, 'A Box of Books'! Eight of them to be precise, all shiny and new and right off of my book wish list. 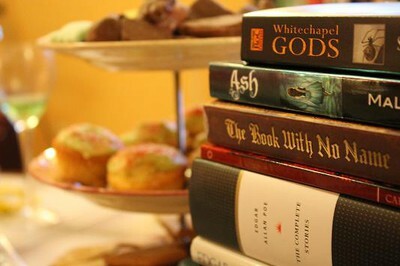 (Yeah, I'm that girl that makes wish lists just for books.) Now, if only I could read as quickly as I make lists. I haven't even been able to pick one to start with. On another delightful note, it hasn't snowed. I'll remind you, I live in Umeå, and it's late November. It snowed lightly for about an hour last Sunday but it never stuck. I'm pretty happy about the lack of snow, if only because six months of ice can get a bit old. I'll be happy if it waits until January to start though I know a Swed or two that would like their snow before Christmas (the real one that is).